all of them. This one is my favorite. I don't have a clue what this is but I know I want to eat one or possibly 2 whole trays of what ever this is! 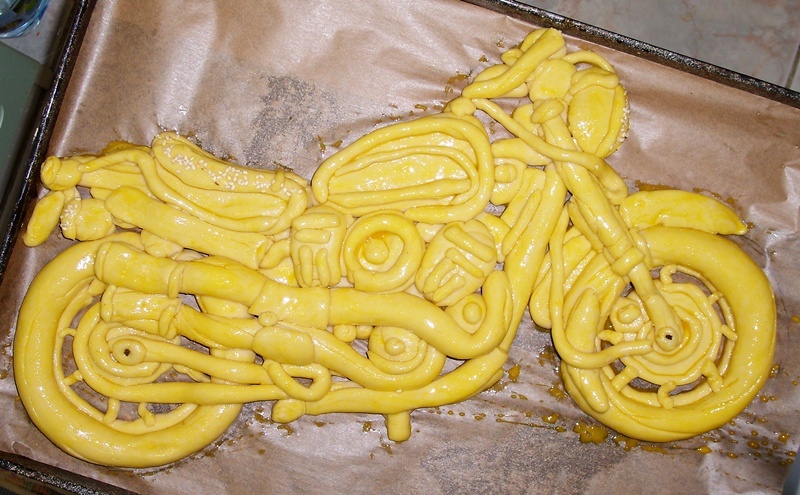 We still like the biker bread the best though. Di niente per l'invio di due vassoio intero! Sono contento che ti piace il mio lavoro e che il motore è un pane preferito! Stilt, this is the best piece of art you have created anyway. Much cheaper than a real bike too. Vogliamo uno uno di questi per Sturgis! Hai ancora bisogno di aggiungere una sana, se tatuato, biker bambino per completare il quadro che ho in mente però :-) Stilt, questa è la migliore opera d'arte si è creato comunque. Molto più economico di un moto reale. Amikor látom a kenyér gondolok, hogy milyen szerencsés az emberek, akik kap, hogy megkapja a kenyér. Ezek a kenyerek sem kivételek. Az ilyen szép alkotások. Várjuk a pék nagyon tehetséges! Köszönjük a post, és a képeket. Davvero un peccato che ci manca molto! Grazie mille! with coconut or bread crumbs or fine grated nuts? pangrattato e tornitura di semola .. I polmoni non lo capisco? Turning breadcrumbs and semolina .. The lungs do not understand? That would be correct. The lungs do not understand.